At Salt Air, we offer a full range of heating and cooling services to meet your business needs. Our HVAC contractors are true experts at servicing commercial and residential HVAC systems. We provide a full range of services including installation, repair, replacement, and maintenance to keep your HVAC system running smoothly. If you want to learn more about our commercial services, call us at (910) 777-3539. As a business owner, you need to make sure that you are providing the best possible environment for your employees and potentially, your customers. The right environment will ensure that employee productivity levels remain high and keep your employees happy. If you want to keep your business at the right temperature for employees and customers, you need to make sure your commercial heating and cooling system(s) are working effectively. That’s where we come in. Commercial HVAC units are different than home heating and cooling systems. These units require special equipment and a knowledge that expands beyond the basics. Commercial HVAC equipment is much larger and heavier and is often required to monitor the temperature for entire buildings at a time. Commercial HVAC systems have single-zone and multi-zone systems options and many business owners need the ability to set the temperature differently within different zones of a building. These systems are more complex to set up as well. You might think that HVAC systems and issues can be handled by any plumber, electrician or maintenance team. This isn’t true. HVAC systems are highly specialized. To repair or replace them and ensure that they operate effectively, you need expert knowledge of different models and experience fixing or servicing them. You can’t install these systems without knowing all the ins and outs of how they operate. We’ve been servicing the Wilmington, NC area for years and have built a solid reputation as commercial HVAC experts that our clients can trust. We truly understand commercial HVAC systems and how they work. We’ll make sure that any issues that you have, are dealt with quickly and get your business back in working order. If you want your HVAC working effectively, trust your Wilmington HVAC experts. When you need high-quality service on your industrial or commercial HVAC unit, contact us. We understand that you want to keep your costs tight and under control and that’s why we offer commercial HVAC service solutions that you can count on. With our professional service solutions, you can get your HVAC systems checked regularly by a team who knows the warning signs to watch out for. You might not notice the signs that your HVAC unit is about to fail but we will. We can repair your system before it becomes a full-blown replacement and save you a fortune. Our aim is to provide the best HVAC solution for our clients and that includes keeping your maintenance and repair costs under control. Has your HVAC system broken down in the middle of the working day? Do you need a quick fix to keep your business operating effectively? We can provide it. Offering full emergency commercial HVAC services that will ensure you aren’t left with a commercial property that is too hot or too cold. Delivering an efficient service, we will work to resolve your issue as quickly as possible and make sure that your business is always in top form. Just like for our residential customers, emergency 24/7 service is available for any service or repair for our commercial or industrial customers. Our work is guaranteed as well. You can trust the professionals at Salt Air Heating and Cooling. 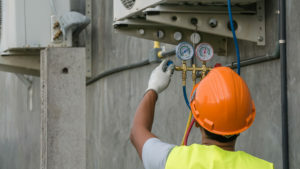 Call Us At (910) 777-3539 For Your Commercial HVAC Service Needs.